This year is the 5th year of the jazz festival in Ilkley, it started from humble beginnings as a day of Jazz at the Summer festival. To celebrate the festival are commissioning a piece of music from well known jazz composer Jamil Sheriff, called the Ilkley Suite, based on Ilkley and the surrounding landscape, which will be performed for the first time on 18th August this year. This year the festival has 30 events, 13 more than last year, across 11 venues of which 4 are new to the festival, with free events, ticketed events and events combined with meals. 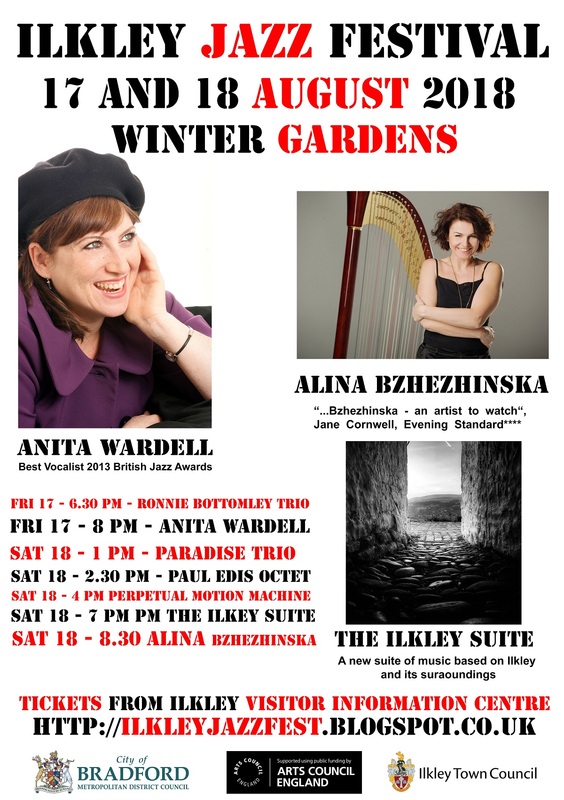 The headline acts this year are performing in the winter gardens and unusually both headliners are female this year, Jazz Singer Anita Wardell has recently moved back to Australia so this will be one her few performances in the UK this year and Jazz Harpist Alinia Bzhezhinska who is now based in London and has been wowing the southern jazz fans makes her first visit to Yorkshire.